Now that you know the story of the Princess and the Pea bead, the question was what to do with the bead? I originally thought a necklace, but nah, I have heaps that I don't wear.... so then I decided on a bangle. 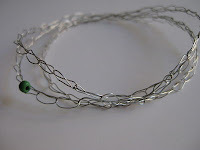 Yes, an easy to make, hard to stuff up, crocheted beaded bangle. Follow the instructions attached and you can whip one up in no time! Note: if you are unable to open the attached doc, send me a quick email and I'll email you a pdf version. Skill level: Beginner, all you need to know is how to crochet a chain! So are you asking yourself...... what Princess and the Pea story? Click here for the post that explains all! 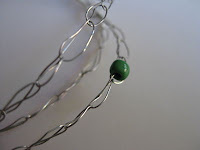 The tutorial reads very well, and now that bead has been elevated into something quite lovely and more than ordinary. especially with that story. Great job!